"Tall Stories (creators of the hugely popular Gruffalo stage show) present their brand new show, based on the much-loved book by Cressida Cowell (writer of How to Train your Dragon) and Neal Layton. One evening, Emily Brown and her old grey rabbit Stanley hear a Thing crying outside their window. He just can't get to sleep. 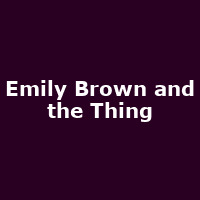 Emily Brown and Stanley set off on incredible adventures to find the Thing's cuddly... his bedtime milk... his medicine... But nothing seems to help him settle. What's really troubling the Thing - and will anyone ever get any sleep?"